Auchencheyne Country House - Holiday Cottage let for short breaks in the Scottish countryside and bed and breakfast stays- Dumfries, South West Scotland. The Auchencheyne Holiday Cottage, Glencairn Valley, is available for 'Bed and Breakfast' stays for 2 to 6 people. The holiday cottage accommodation is based in a separate wing of the Auchencheyne Country House, a beautiful 18th Century home set in stunning grounds and the Dumfries countryside. The layout of the wing makes it a cosy B&B stay for 2 people, as well as having ample space for more guests. 'Bed and Breakfast' accommodation includes 1 double bedroom and 2 twin rooms, each comfortably decorated and well proportioned. The double room has an en suite bathroom, and the twin rooms share bathroom, one with a shower to invigorate after a day walking in the surrounding scottish countryside, the other a large tub to soak in before dinner. Visit the homepage to see larger images of the accommodation. Baby facilities are available, please enquire about your requirements. Auchencheyne House is a working farm and we offer organic vegetables and eggs from our 30 free range hens for sale. Well behaved dogs are welcome. 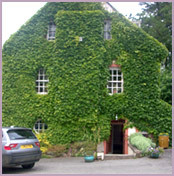 The holiday cottage accommodation can also be booked on a weekly let or for longer breaks. We are sure that once you have stayed with us, you will be back for a longer stay to explore the beautiful surrounding countryside! Breakfast includes fresh farm produce.